iOSデバイスでアルファベットの「i」を入力すると「A[? ]」が表示される問題はiOS 11.0から発生しており、Macでも文字化けが確認される。 | AAPL Ch. I am on my iPhone 7 plus with iOS 11.1 (issue started on the previous version 11.0.3 and continued after updating to 11.1) and this afternoon started noticing a capital ‘A’ followed by a question mark in a box appear in my predictive text field. -If you updated your iPhone, iPad, or iPod touch to iOS 11.1 and find that when you type the letter “i” it autocorrects to the letter “A” with a symbol, learn what to do. 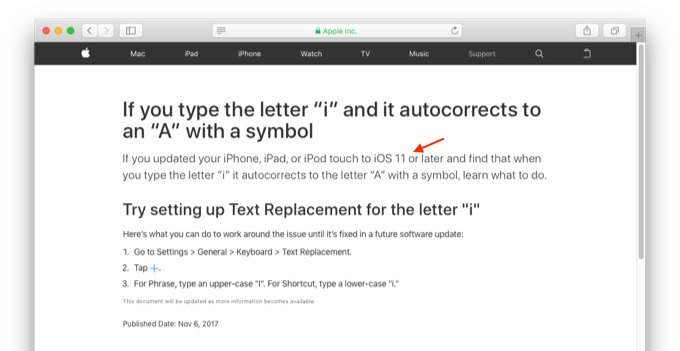 +If you updated your iPhone, iPad, or iPod touch to iOS 11 or later and find that when you type the letter “i” it autocorrects to the letter “A” with a symbol, learn what to do.